Plants in the ocean can be hard, soft, slimy or even delicious. Sea plants grow in every color and often have weird names like sea lettuce and devil’s apron. Hundreds of species grow all over the world, but sea kelp is a special kind of ocean plant, the largest and the most critical plant to the survival of many endangered sea animals. Kelp adaptations for survival help the plant thrive in the demanding ocean environment. Kelp is a large greenish-brown plant that can grow more than 175 feet tall. It has many leaves, called blades, which are shaped like swords. To grow so tall, each blade at the top of the kelp splits into two. At the base of these blades, the plant has “bladders,” little ball-shaped pods that are filled with air and gas. These bladders help the kelp stay upright so the tops can reach the sunlight. Kelp is found in the Pacific Ocean, most commonly near Western Australia, Japan, Mexico and California. Kelp thrives in cold water with lots of waves or a strong current; this turbulence brings nutrients that are necessary to the kelp's survival. 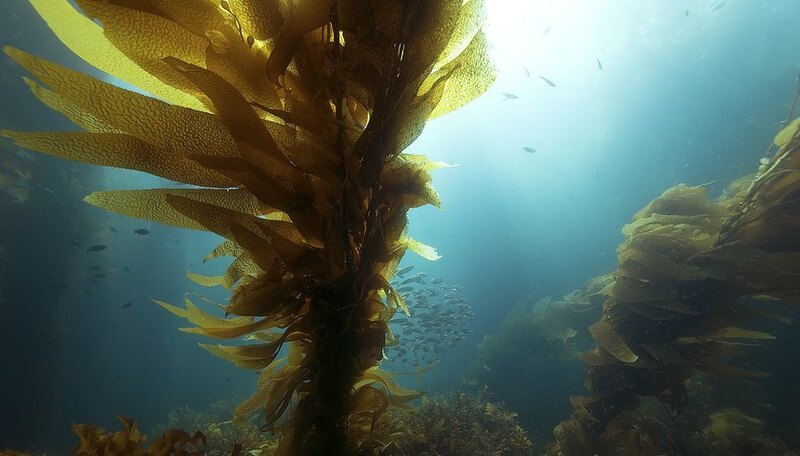 To reproduce, the kelp creates tiny zoospores that float away to create new kelp and, eventually, a kelp forest. The canopy and sea bottom of the kelp forests house crabs, eels, sea sponges and many varieties of fish. There may be other kelp forest plants, although some of these may actually be animals; the most interesting animal among the kelp may be the weedy sea dragon, which is a kind of seahorse that looks just like a floating piece of seaweed. Large animals like to hang out in the kelp too, such as dolphins, turtles and sharks. The giant sea otter, an endangered species, is often found in areas with a lot of kelp. Kelp is a very nutritious plant to eat and is a common food in Japan, where it is used in soups, salads and sushi. It can help people with some illnesses feel better and provide nutrients for healthy hair. Extracts from kelp and other seaweeds are used in toothpaste, ice cream and shampoo. Kelp may have also helped ancient humans navigate the sea between Asia and North America. Kelp shelters a number of sea creatures, some of which are endangered. The inhabitants of the kelp forests eat the blades for vital energy. Some of these creatures are also food for bigger ones; for example, sea otters eat sea urchins, which in turn can eat an entire kelp forest if no otters are around to keep them under control. Many fish will hide from predators in the kelp forests or may use its shade to raise a family. Joy, Vail. "Sea Kelp Facts for Kids." Sciencing, https://sciencing.com/sea-kelp-kids-7930200.html. 25 July 2018.